Most of the time pond fish are pretty hardy and make it through winter with no problem. But there are times when that’s not the case…and you find one, or two…or maybe even all of your pond fish have died over winter. So what gives…what could be the cause of your pond fish dying over winter? When the colder weather starts and the water temperatures drop to 55 degrees your fish will start going into their state of semi-hibernation, which means their digestive tract starts slowing way down. This is the point where you need to stop feeding your pond fish, because they will not be able to digest the food. And any leftover food will sink to the bottom, along with any waste produced by your pond fish, which then decompose and release ammonia. Any good bacteria in your pond are using the available oxygen to eat up the ammonia, from here the ammonia breaks down into nitrites and nitrates. Nitrates are lethal to fish. So, in winter, there are usually two main causes of death for fish. Oxygen Depletion – With a sheet of ice over your pond, the amount of oxygen in your pond is limited with no free exchange of oxygen like there would be when it’s warmer out. Your pond fish need oxygen, you pond plants need oxygen, and the beneficial bacteria in your pond need oxygen. Poisonous Gases – Like you read earlier, the beneficial bacteria use oxygen to eat up the ammonia, which is then broken down into nitrites and nitrates. A build up of ammonia or nitrates can be lethal to fish. …and in winter, when the water turns to ice, there is no way for these poisonous gases to escape. Aerator – An aerator is one of the most, if not the most, effective ways to prevent winter fish loss. An aerator produces a column of bubbles, allowing more oxygen to enter your pond. 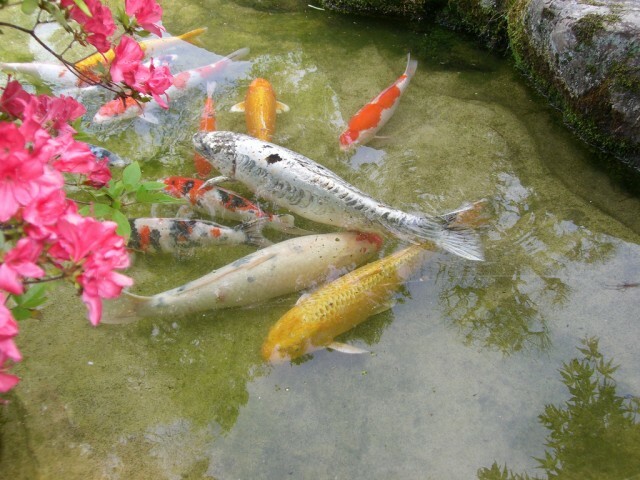 The added oxygen will be used by your pond fish, any plants, and by the beneficial bacteria. An aerator can be used year round, so it’s not just a winter thing, in summer when your pond is very active the beneficial bacteria will be able to consume and break down more organic material, with the added oxygen provided by the aerator. Pond Heater/De-Icer – In winter, you should have a hole open in the ice to allow for the exchange, and escape, of gases. However, using a drill, a hammer, an axe, a knife, your shoe, a chisel, a Katana sword, a mace, a scythe, a dagger, a warhammer, a staff…a sickle…whatever your weapon of choice…is a big NO, so don’t even try. You will only do more damage, and your fish can die from shock, so lets not do that. But there is a good way to create a hole in the ice. A pond heater/de-icer will create the hole for you. It works by the unit heating up, which in turn melts the ice around it, creating a hole. Just remember…NO WEAPONRY. So, lets try and prevent your pond fish from dying this winter by using an aerator and a pond heater/de-icer, both working very well together. 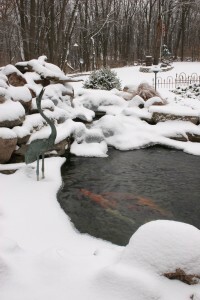 If you don’t have an aerator or pond heater, or maybe you need something else, contact us today so we can help your pond fish live through winter. You can also see some of our recent water feature and landscape projects by visiting our gallery, and find answers to frequently asked questions in our blog. If you know it’s an animal that is obliterating your fish, then you have a different problem…a fish cave would really help that problem.